Twitter is often maligned as fast and simple chat for empty headed gossips. This may be often true. But if its combined with good journalism fact checking, it can help create an unprecedented network of sources providing global reach, diversity and credibility. 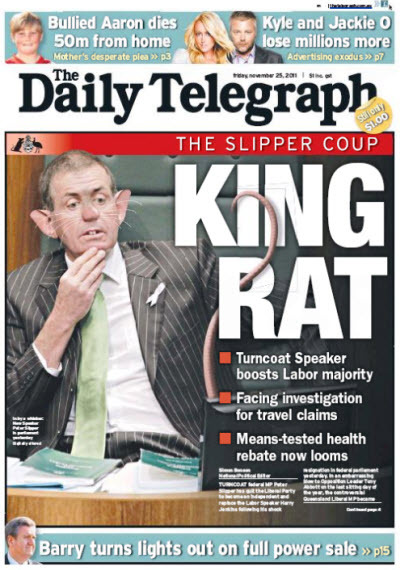 You could expect the Liberal National Party to be angry about MP Peter Slipper ignoring party orders and becoming Speaker of the Australian parliament. His switch was an embarrassment for the aggressive opposition leader, Tony Abbott, who until then, was confident he could force a new election. But what of reporters at News Corporation dropping any pretense of objectivity and larding their reportage with abuse worthy of a shock jock?